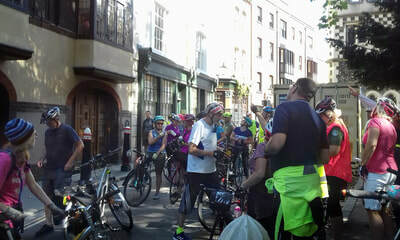 30 riders at the new start location, Southwark Needle on corner of London Bridge and Duke St Hill. Several riders had arrived by train, taking advantage of the new lifts in the Station to get from platform to the road level. Started across the bridge and down a narrow cobbled street to the E-W Superhighway (CS3). Smooth ride along CS3, but greatly delayed by the many stop lights. The light stages for cyclists are not long enough to get 30 cyclists through, so there was a certain amount of waiting around to keep the group together. At Blackfriars up the ramp to the N-S Superhighway (CS6). This has recently been extended to Charterhouse St. Riders commented favourably on the slightly elevated section under the Holborn Viaduct. Just having a sensible 1-way track on each side of the road is nice. Much better than the southern part with a single 2-way track. At Farringdon the segregated track runs out, although it will eventually be installed there. Soon turned off and took the back streets of the CS6 route. These are hardly a "superhighway", but OK for a leisurely healthy ride. Before Kings Cross turned west to join the semi-segregated paths along Tavistock Place before turning north on Gordon St. Here we had fun! The north end of Gordon St was packed with new students. This was clearly the first opportunity for students to get their Student Cards and access to cheap travel and other discounts. Huge queues filled the road and an adjacent street. Thoughtfully UCL Union had a live band playing and food stalls to keep people sustained while they stood in line! Having made it through the students, crossed Euston Rd and into the maze that has been created by the work for HS2. The access to Euston St, our route, was not at all clear and some cyclists at first missed it. Finally we re-grouped and were able to continue without road blocks to Regents Park where we had a well-earned break at the Cafe on the Broad Walk at Chester Road. 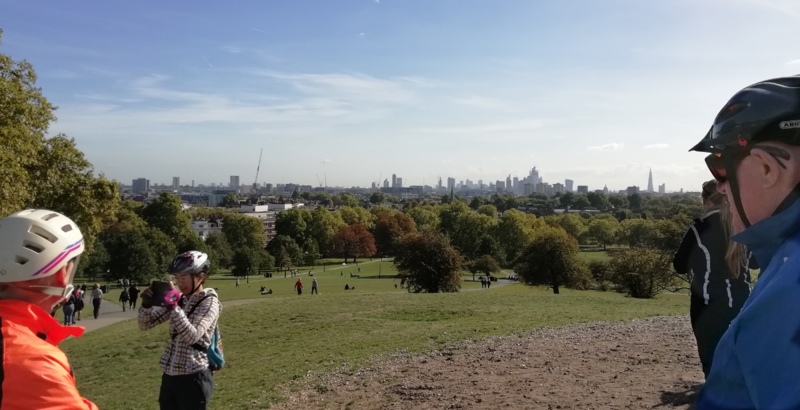 Continued up the Broad Walk to Primrose Hill. Great views from the top on what was turning out to be a beautiful sunny day. After a few photos descended and rode via Gloucester Avenue and back streets to Camden High St. As usual at a weekend, crowds of shoppers shopping, or maybe just heading for Camden Lock for a beer in the sunshine. Did not linger and headed east to Royal College St and joined the Regents Canal towpath at Bayes St. Towpath not too busy so we made good progress to Kings Cross. First stop at the gasholders. One of these is a circular mini-park/art installation with angled mirrors all round. We did a few circuits (taking care to not annoy the few pedestrians) and took photos and a short video, see below. Round to Granary Square but alas no fountains. The square was being set up with stage and seating for Time Out magazine's 50th Anniversary party. Time was nearly out for us, so took a direct route from Kings Cross, past the British Library to rejoin the outward route at Marchmont St. Down CS6 to Blackfriars Bridge. The left turn from the bridge to Southwark St is a nightmare with 30 riders! One of the problems with having a cycle track on the wrong side of the road is that left turns become difficult. TfL's solution is a tiny box marked on the road where you wait and try to beat the traffic away on the next light stage. The traffic was quite considerate in our case, but you do feel you are surviving despite the road layout! Quickly along National Route 4 on the back streets next to the river. Called a halt at the small riverside square beside Southwark Cathedral. To my amazement we had made up for earlier delays on the final part of the ride and were pretty much on time at the finish. Many thanks to David, as usual looking after the back of the group on the road and helping keep everyone together. Despite forecast rain showers 16 Healthy riders including some juniors braved the wet for this week’s easy paced ride. 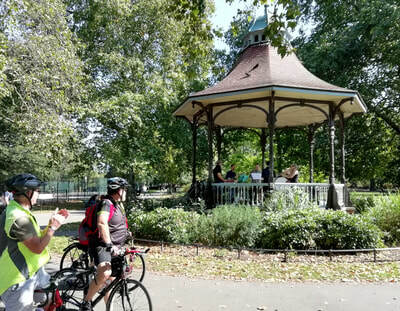 We set off from Peckham Square in the dry along the canal path, doing a bit of a loop to get to Burgess park then across to East Street and heading for New Kent road where we were greeted by Philippa. Promptly arrived at the 1st location, the site of Horsemonger Lane jail now known as Newington Gardens. We stopped to read the history on the notice board located just inside the entrance (photo below). Next we were off to the site of the 2nd prison, Marshalsea. Within the grounds of the garden is one of the original walls with a plaque giving a brief history (another photo). By this time it had started raining lightly so moved on and picked up the newish Q14 along Newcomen street. The Q14 route had not been constructed on last years ride so gave us a good chance to test a short section of it. Taking the back streets, we passed under Southwark bridge and turned right into Bear Gardens the location of the Ferryman’s seat. This is built within the wall of what is now a restaurant. Philippa and I tried the seat for size, its more of a perch rather than a seat (photo). We were overlooking the river Thames, it was not sunny with grey skies and still raining lightly (photo). Soon back on our bikes and off to the location of the 3rd prison, Kings Bench prison located at Scovell Street. Here there is no signage or plaque referring to the prison and the area is now a 1970s estate. We headed back to Peckham via Q1 and were there in good time. Many thanks to Philippa who helped out on the ride and to David for doing back marker duties. Track at www.mapmyride.com/routes/view/1760844296, gpx file on right. Leader Harry. Another dry day - we are getting used to this - will be a shock when it rains on a Saturday! Ride led by Jane, whose report follows. 33 riders followed the route outward across Westminster Bridge and onto the “newish” cycle path along Birdcage Walk, around Spur Road and seamlessly onto Constitution Hill. Our prompt departure meant that we got through here before the crowds gathered to watch the changing of the guard at Buckingham Palace. Once again we almost had the South Carriage Drive section of CS3 to ourselves and made good progress through Hyde Park past Kensington Palace and on to Holland Park arriving at the Design Museum at 11h00. 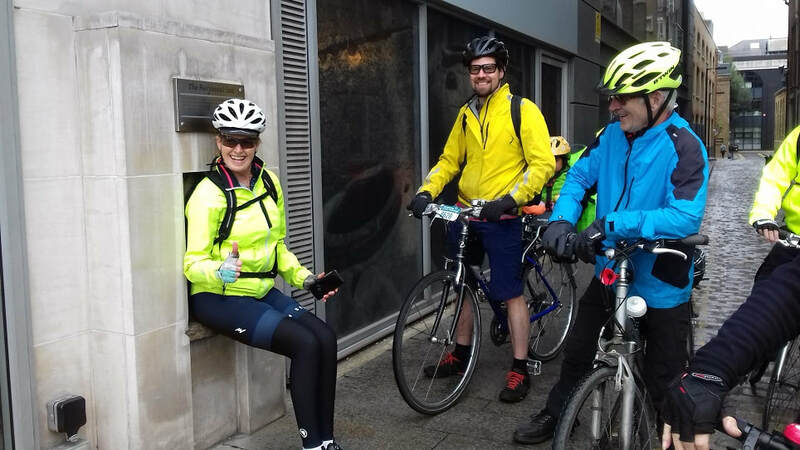 We had time for a 25 minute break, but a busy and under-staffed café meant that some riders spent a long time queueing for refreshments; fortunately we also had Gail’s Bakery and Café Tarte further along the high street to choose from. 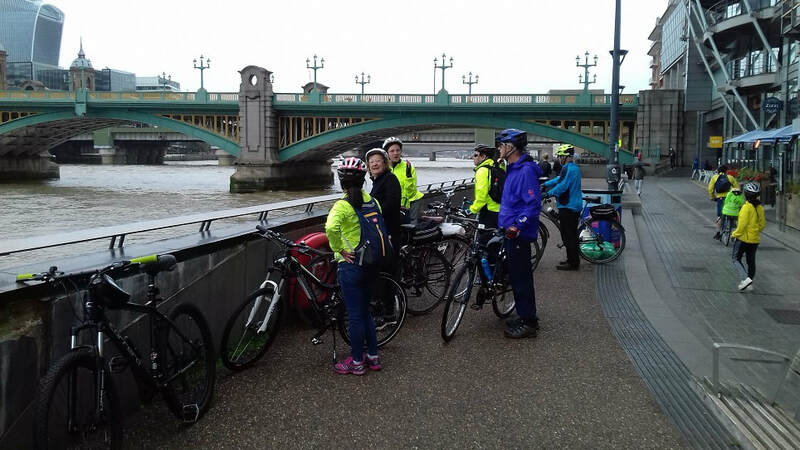 The return journey took us via Brompton Cemetery and across busy roads down to the old Lots Road power station (another luxury flat development) and the river route across Albert Bridge and then a circuit of Battersea Park. We exited the park using the pedestrian/cycle bridge under Chelsea Bridge continuing under the railway bridge and past the Battersea Power Station river frontage with its new bars, restaurants and posh shopping opportunities at Circus Road West. 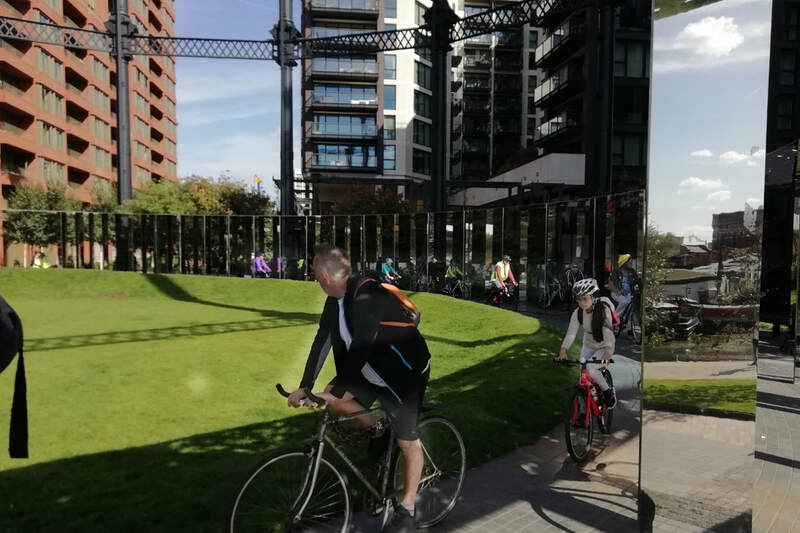 The route through this massive redevelopment has recently opened up to traffic and we followed Pumphouse Lane to join Nine Elms Lane and continue our route home up through back streets of Battersea, Stockwell and Kennington to Camberwell. A small French boy at Kensington Palace telling his papa excitedly that “An army of cyclists” was coming! 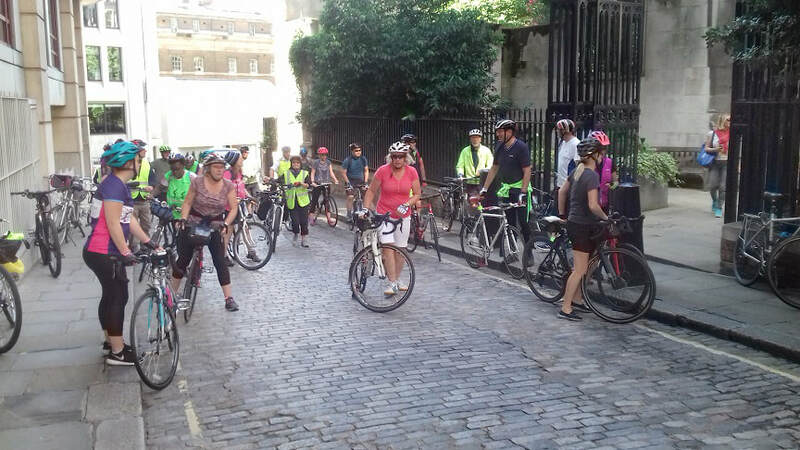 Getting a round of applause from a big, happy family group with scooters and kids bikes in Brompton Cemetery – we must have been an impressive sight! This is a great route which takes in many of our iconic buildings with lots of interest for all. Inevitably our progress was rather “stop/start” given the large number of riders and the number of busy junctions and sets of traffic lights to be negotiated – with thanks to David for bringing up the rear - but we kept together well and made it back to Burgess Park dead on 13h00 (by my watch)! 17 of us including 3 youngsters on bikes and one in a child seat. Weather fine but a bit cooler than of late - perfect for cycling. 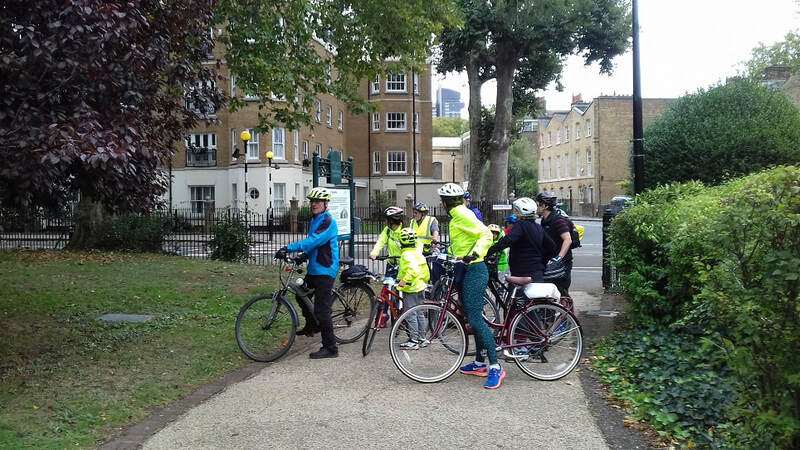 Headed off across Southwark Park, round to the Blue and south to Stevenson Crescent where we joined Quietway 1. Proceeded to Oxley Close there I turned south on autopilot completely forgetting we were supposed to stay on Q1 to Trinity Square. Rapid turn around in coopers Rd saw us back on Q1. At Trinity Square turned on to Quietway 7 along Falmouth Rd. Q7 is not as well-designed as Q1, but there are some nice bits. The short segregated stretch on Rodney Rd and, on our route, the redesigned junction at Albany Rd. Portland St was pretty quiet, unlike weekdays. Took a loop to the west end of Burgess Park where new paths have appeared. Then through to the Eastern part with a brief stop at the Park Life Cafe, the start for the next ride. Round the lake and out on to Glengall Rd and north to Q1 at Oxley Close. Some deja vue on this stretch.... East along Q1 past South Bermondsey Station, then dropping down to Bolina Rd. This is much changed following all the Thameslink work and is now filtered close to the second rail bridge. Turned right along Silwood St, then right again on to the old path beside the railway. Rejoined Q1 just after passing under rail bridges. Took the shared path along Surrey Canal Rd, then departed Q1, passed through Deptford Park and crossed to the new Surrey Canal Linear Park. Had time for a circuit of South Dock before returning to Canada Water via Greenland Dock and the Shopping Centre. Made excellent time and all finished feeling healthier than before (I hope). Route at https://goo.gl/evzj3g or gpx below. Sept 1st. 10-12. Dulwich to Vauxhall Loop. Good turnout on a sunny morning in Dulwich Park. 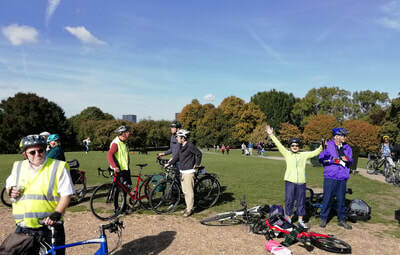 20 of us headed off to Brockwell Park and Brixton. Traffic in Brixton very congested. The usually useful bus lane was occupied by a pack of aggressively driven buses. Most unpleasant. However we made it on time to Vauxhall Bridge where we were able to see the final exit of the River Effra, whose valley we have been following, into the Thames. Not time to do the hoped-for detour to the new US Embassy, maybe will manage this on the + ride on Sept 15th. Return route took us to Kennington Park where we had a short loo break. Then on to Myatts Field and a surprise - a small wind band playing on the bandstand. We ride past band stands in parks on many rides, but rarely see them in use. One rider was so inspired she decided to leave the ride and stop to hear the whole programme. Route at http://tinyurl.com/y7ul6r9r and GPX below. A cool morning with occasional sunshine - felt quite autumnal. 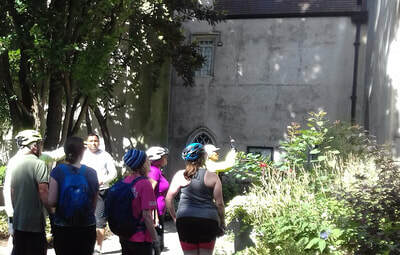 17 riders set off from Peckham Square and made for Nunhead Cemetery, the first of 4 planned for this ride. Across the cemetery then via top end of Peckham Rye Park to Camberwell Old Cemetery. From there a short run to the Horniman Museum where we stopped for a comfort break. Headed out from the Horniman but managed to lose the group who nearly turned left and ended up in Forest Hill. After this short hiatus, gathered everyone and took the narrow leafy path northwards to Brenchley Gardens and cemetery number three, Camberwell New Cemetery. Next over the railway and down to the last, 4th, cemetery Brockley and Ladywell. Followed the relatively rough paths through this cemetery to exit on Ivy Rd. Running short of time so skipped Hilly Fields Park and returned via Ivy Rd and Frendsbury Rd to Nunhead, then down the hill to Peckham. Route at http://goo.gl/XzFkTD. 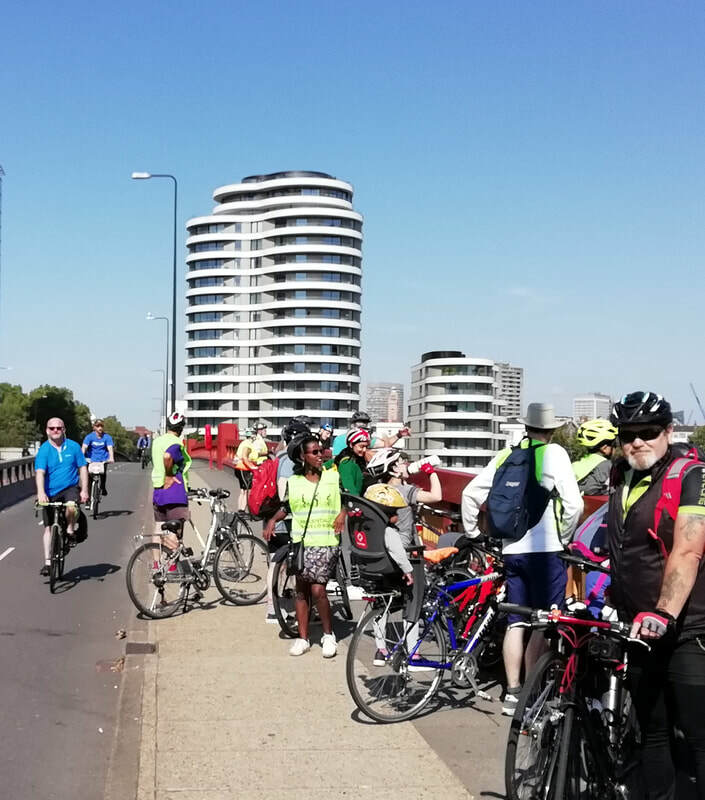 A ride to celebrate the Saturday morning Healthy Rides and the opening of the new section of the Thames Path east of the Barrier (the “missing link”). 17 cyclists set out at 9.30 from Peckham Square under grey skies. Picked up more riders at Canada Water and Cutty Sark so that around 36 eventually arrived at the Thames Barrier to meet up with about 30 from Bexley. Most of the 66 riders traversed the missing link (see video below). It was a quite different event to our usual rides and, in terms of numbers, record-breaking. 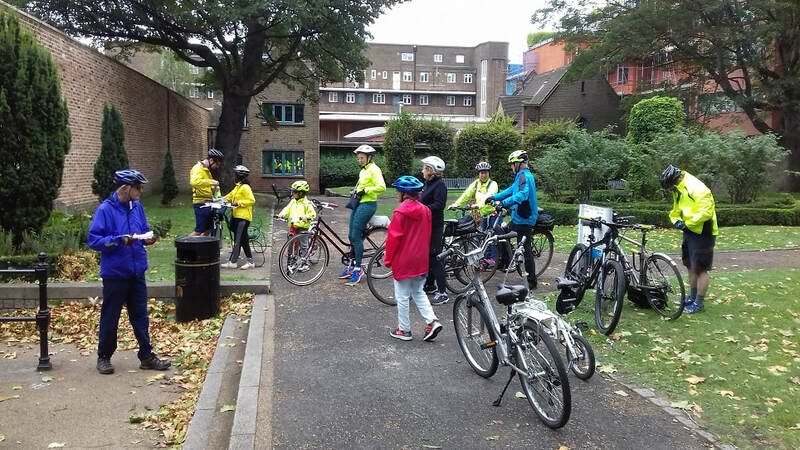 Full report on the Southwark Cyclists Web Site. Route at https://goo.gl/kneMyH or gpx below. Aug11th, 10-12. The Oldest House in the City. Another beautiful sunny day. But butterflies not as numerous as you might expect. Are even the invertebrates feeling the heat? 12 riders at Dulwich Park Cafe headed to Ruskin Park. 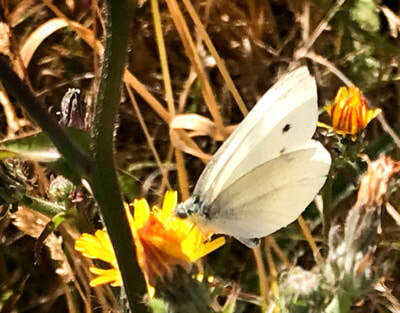 Excellent wildlife area had lots of white and blue butterflies and even the occasional brown one, so a good start. In next stop Elim Open Space where much of the scrubby growth around the derelict pond area had been cut back. Still enough to interest some white and blue fliers, though. This area could be so nice iif given a bit of TLC. So come on Lambeth - Ruskin Park and Myatts Fields are getting help. Give Elim a bit of too. Next stop was Myatts Fields. 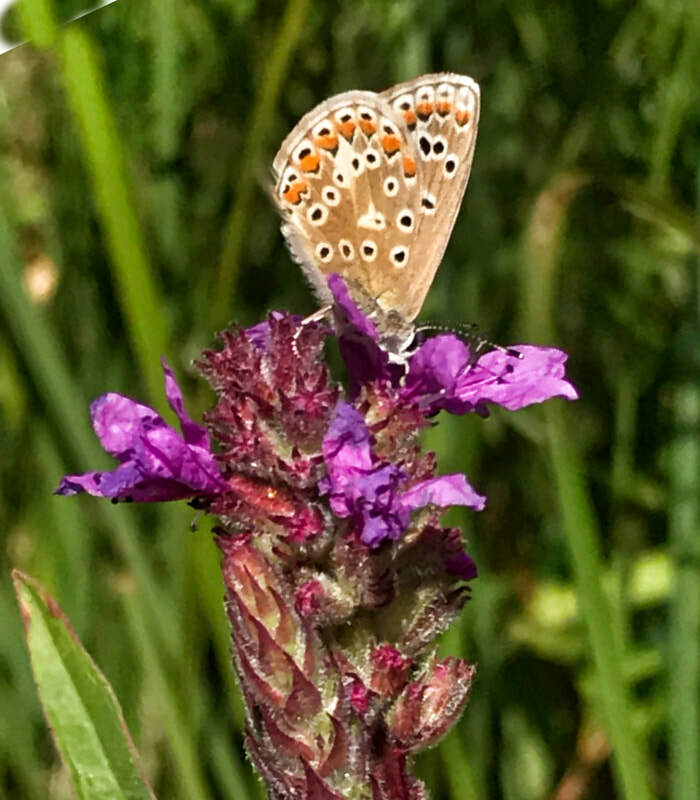 Another productive wildlife area here with, like Ruskin Park, unexpectedly small numbers of butterflies, mostly white with a few blues. From Myatts Fields back into Southwark and Burgess Park. New area along south edge of the west side of the park looked very promising, but extemely dry and just a few whites on the move. The more formal flower gardens were greener with quite a few nectar-rich plants. However, not attracting many butterflies. Maybe very arid weather has reduced nectar yield. After 9.5 miles of gentle exploration had seen Large and Small Whites, Common Blues and a Gatekeeper. On previous rides not during such a long dry spell had seen more butterflies. So maybe just too much sunshine this year! 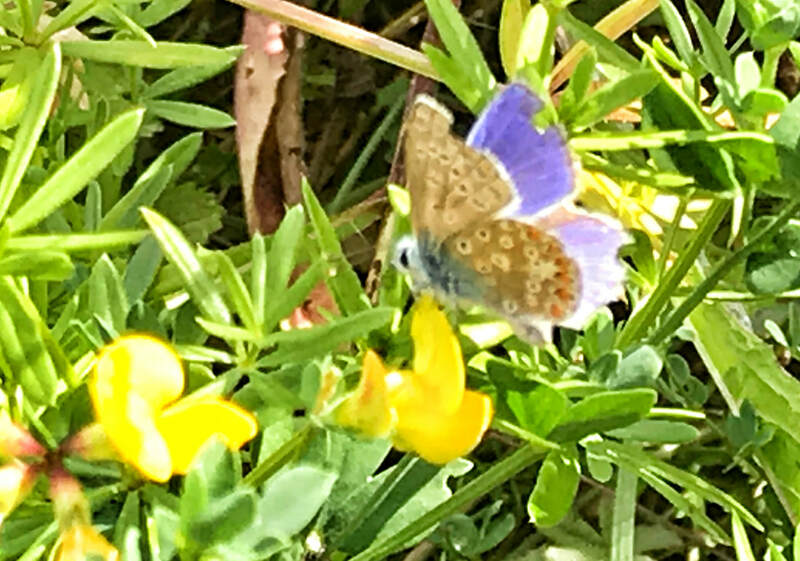 Be interesting to see the national statistics form the Big Butterfly Count for 2018 when they are published. 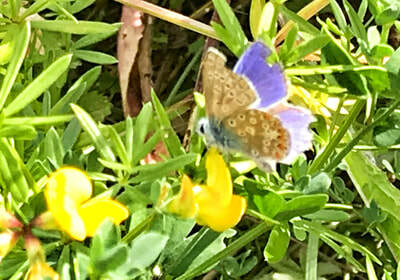 Keep an eye on BigButterfly Count web site (https://www.bigbutterflycount.org/). Many thanks to Peter who managed to take some great photos. Route at https://tinyurl.com/y9yegxkf or gpx file below.